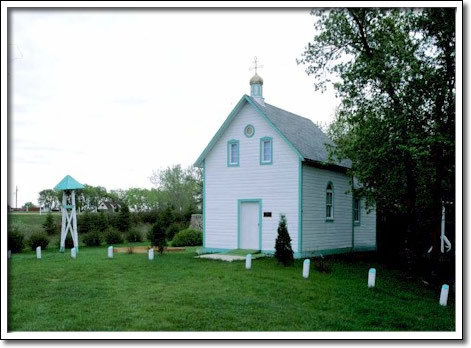 This, the oldest remaining Ukrainian Catholic church in Canada, was constructed in 1898. The Ukrainian pioneers who built it arrived in the Valley River area in 1896. They persuaded Father Nestor Dmytriw, editor of the American newspaper Svoboda, to visit them while on a Canadian tour, and it was here that he conducted the first Ukrainian Catholic mass in Canada. That mass, celebrated in the spring of 1897, was held in a home at what is now called the Cross of Freedom Site. Father Dmytriw encouraged the congregation to build a church, which they did the following year. St. Michael's is architecturally modest. Built of logs and covered with wooden siding, it's very small, measuring only 4 by 5 metres (12 by 15 feet). However, the interior is a remarkable example of Byzantine-style icon painting and decoration. The church, which has been threatened over the years by rural road development, has been moved twice, finally finding this safe haven through the dedication of local heritage enthusiasts.